In a world filled with selfies, stories, and other social media shenanigans, the pressure to look good in front of the camera has never been fiercer. And with prom night rapidly approaching, you and your gals are sure to be all over Snapchat and the ‘gram (unless you’re taking a much-needed break from social media, which in that case…good for you, girl!) But as far as posing, a simple smile can be a tad…boring. And peace signs and duck lips? Let’s not even go there. Slay in front of the camera with our tips for owning every picture, video, Boomerang- anything, really. Okay, okay, we know we mentioned that a simple smile can be a little too basic, but hear us out! For those classic moments when you just have to (hello posing in front of the mantel! ), gently press your tongue to the roof of your mouth as you grin. This trick helps lengthen your neck and jawline and (ta da!) eliminates a double chin. Sign. Us. Up. Repeat after us: Do. Not. Slouch. Rather than over-arching your back, pretend an invisible string is pulling you up from the crown of your head. Think of lengthening versus bending your spine back (because…ouch). Fact: no one looks flattering facing the camera head-on. Whether you’re in a group photo or posing solo, angle your body about 45 degrees to the side (i.e. midway between facing the camera and totally sideways) Don’t forget to tilt your face slightly as well, and if one arm is free, place it on your hip for a super slender effect. 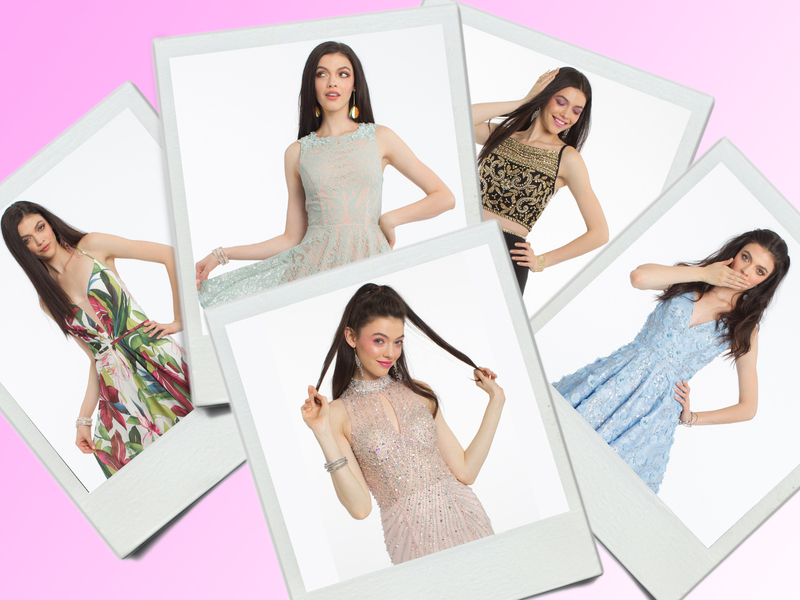 Looking fab in photos is truly a head-to-toe effort! Make your legs look long, lean, and model-esque by crossing one foot behind the other. Bonus: this tip also works if you’re sitting down! This one only applies to group shots. Whether you’re posing with one or three of your besties, have everyone casually do their own thing for a natural, non-stiff look. Pop one leg, blow a kiss, or giggle while looking at the gal next to you for an adorable, we’re-totally-being-spontaneous shot. The best tip for a flawless photo? 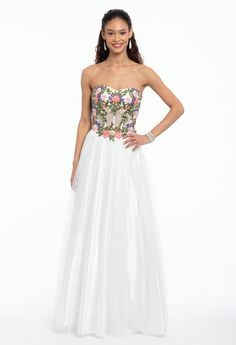 A standout prom dress! Find endless styles on CLV.com. « Brooklyn and Bailey Take Over Camille La Vie!